Silver Birches Surrey Hills Landscape. This window is 2650mm x 1500 mm so a lot of glass! Each of the panels is encapsulated into sealed units with the additional protection and energy saving Argon filling and a soft coat which is applied to the inside of the house side piece of toughened glass. These units are made up of 2 pieces of 4mm toughened glass with the stained glass sandwiched in the middle. In the winter of 2010 my customer visited me to discuss a project they were just embarking on. A beautiful new house they were building made of green oak and set on a plot in Reigate, Surrey. 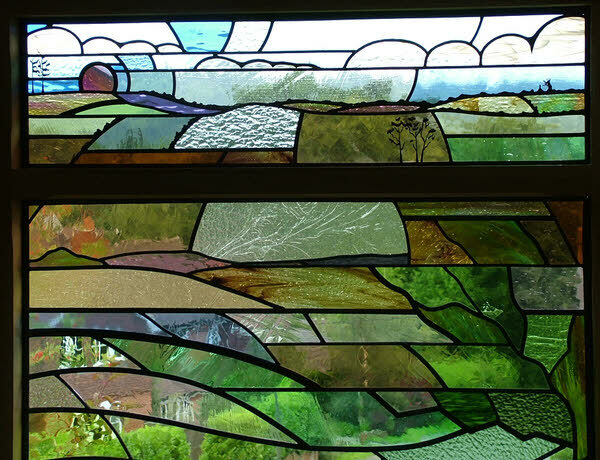 She has always wanted some stained glass and when part of the planning required they have an obscured window, it was felt that this was the ideal time to investigate the possibility of this. Luckily she found me and we immediately ‘clicked’. I listened to her requirements and took notes and it seemed as if I were meant to make this window for her. Some months later I came up with a design which essentially is the one I made with a few tweaks here and there. My customer even came in for a few hours to help create some of the fused pieces of glass in the foreground. 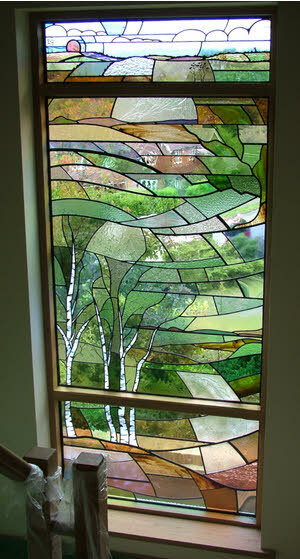 The design depicts the gentle rolling Surrey Hills with Silver Birch trees. 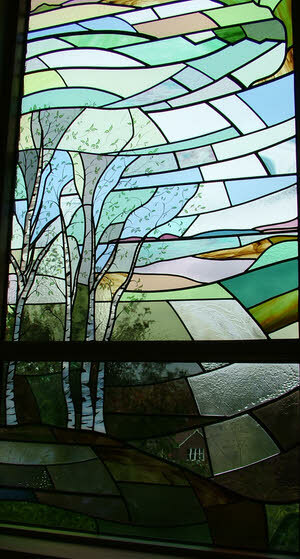 I initially started designing with oak trees but this felt too obvious and so I changed to silver birches. This has allowed me to use this wonderful white streaky opal glass for the trunks of the trees and this works brilliantly at night too as with face light the glow. I have included a nod to the wonderful oak in the top right hand corner of the middle panel! 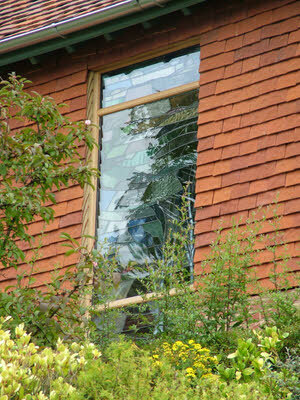 The glass is cut in a rich mixture of textures and colours all of which successfully enhance and are sympathetic to, the oak within the building. Nothing too garish or bright and plenty of soft tones. In the foreground I have included some of my signature pieces of fused natural elements, grasses and seed heads fused and cast in to the glass. I have used a vanilla and a powder blue opalescent glass powder to create some of these images and this also will show up well at night with face light. Making sure that not the whole of the window is a black hole! 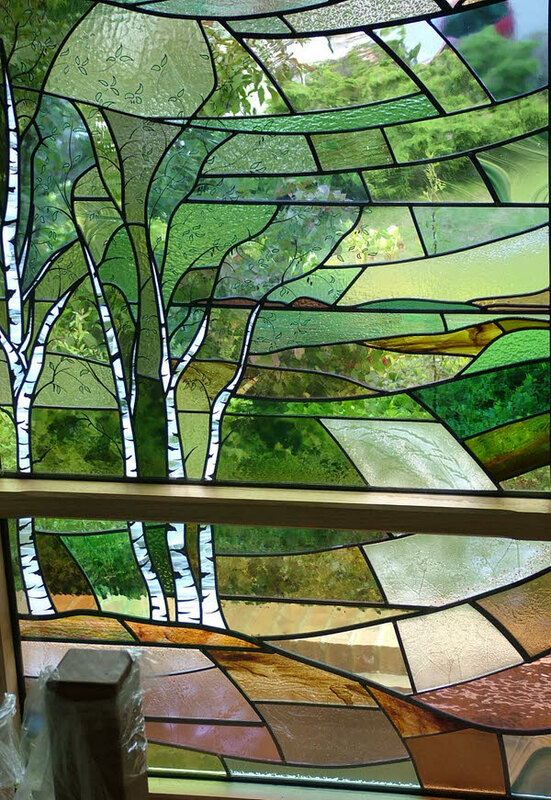 The silver birch leaves are painted enamels, fired in the kiln. It took me ages to find just the right translucent enamel for the leaves and one that stays more or less the same colour which ever colour glass it is painted onto! 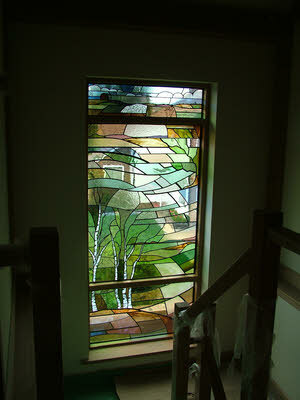 I’ve cut the window using a lot of mouth blown antique glass mixed with some lovely machine made glasses. There are some beautiful piece of mouth blown glass purchased from The English Antique Glass Company, fitting for a home made in England by Oakwrights.